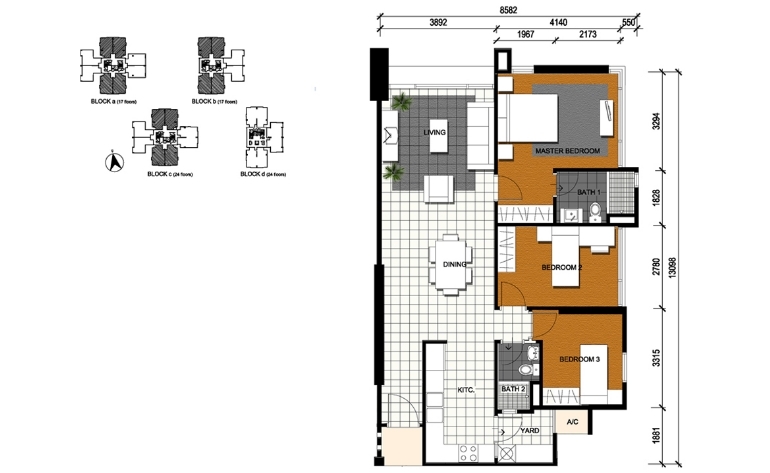 Type B3 - Floor Area : 1,085 sq. ft.
Wash Basin (WB) : 2 nos. Water Closet (WC) : 2 nos. Shower Head : 2 nos. Light Point : 15 nos. Fan Point : 1 no. Switch Socket Outlet : 14 nos. TV Point : 2 nos. Intercom Point : 1 no. Telephone Point : 2 nos. Water Heater Point : 2 nos. Air Conditioning Points and Piping : 4 nos. Door Bell Point : 1 no.